Merry Christmas! We hope that you are enjoying your Lord and Savior during this special time of the year. It is a challenge in America to not be distracted from our devotion to Christ with all the activities and busyness of the holidays. Paul wrote the Corinthians, “I am afraid that, as the serpent deceived Eve by his craftiness, your minds will be led astray from the simplicity and purity of devotion to Christ.” 2 Corinthians 11:3. The Amplified says, “that your minds may be corrupted and seduced from wholehearted and sincere and pure devotion to Christ.” We pray that you would be able to hear God’s voice when you read His word, love your family and friends, share the good news with the lost, and worship Jesus Christ without distraction! Columbia House Church Conference Danelle and I helped lead a house church conference with Riverbend Community Church in September. There was a lot of enthusiasm to learn and make disciples in Columbia and throughout the Southeast. Just this week Danelle and I met with Robbie McAlister, Sarah Bedi, and Ray Vaughn to evaluate, plan and pray together for 2012 and how we can be a part of a church planting movement. Look for information about conferences next year which train and inspire us. Giving Danelle and I thank you for your support! Many of you have stood with us for years. Some of you may wish to send a special year-end gift, and/or being to support us monthly. Please visit the GCM website www.gcmweb.org, or call the office, 407-671-9700 and they will help you. Thanks again! Ukraine and Latvia in February In February Danelle and I plan to return to Europe and work alongside our good friends and missionaries, Timmy and Kenyon Powers. We plan to travel to Riga, Latvia and work with Andris Dekants and his new wife Alicia (left). They have a heart to reach their country with the gospel. Then we will also return to Odessa, Ukraine to encourage Gennady and Lena Grazdanken (right). We will be teaching the believers in each of these countries for several weeks. Tanzania Mission in May Lee Gordon, from Gator Christian Fellowship in Gainesville, Florida, invited me to join him and a small team to go to Tanzania in May for three weeks. Our desire is to see a church planting movement started in the remote villages of Tanzania. I have been told there are very few churches in these remote areas, so I am excited to see how God will use us. We will also drill wells and minister in orphanages. We will need your prayer support and will send more information later. the content of Secure In An Insecure World. BTW, you can order my book for Christmas gift from our web site, www.gcmnelson.com or as an e-book from Barnes and Noble, Amazon or I Tunes. Housing Update Thank you for praying for us about this. God heard and provided an old house near my mother. It took six intense weeks of remodeling to get it ready to live in. We have been in our house for a week now, but it will still take a few weeks to finish unpacking and finish all the little things - like hanging light fixtures. We praise God that we will be settled, organized and better able to serve others. It is a huge emotional blessing for us to be at this point! Faithwalkers Conference. Our teaching at Faithwalkers to minister to everyone’s needs and be a blessing. Pray for God to encourage all who attend. We would come away abiding in Christ and rejoicing in Him more consistently. Tanzania Mission. Pray for our team to be united. Pray for us to have discernment to be fruitful in this culture. Pray for God to raise up many men and women of peace, teachable and filled with faith in God. Please pray for the finances for Danelle and I to minister overseas and here in the Southeastern US. Finally! There is a little chill in the air here in Atlanta and we are loving it! We are also excited about what God is doing here in the three house churches. One of our members recently went through an ordeal with her husband’s health. She said, “I think God brought you back just for me!” We continue to seek God, learning how to hear from Him through His word and His Spirit, minister to one another, and reach the lost. Gospel Opportunities Recently, our son Scott, who is also in one of the house churches, gave a contractor a copy of Secure In An Insecure World. Today this man was working on my mother’s house and said he finds my book very interesting and useful. He told me he is on his fourth marriage and really needs help with relationships. Please pray for him to come to know Christ! Columbia House Church Conference The weekend of September 30th Danelle and I are going to South Carolina to help lead a house church conference with Riverbend Community Church, which has 3 house churches at this time. We are eager to see what Jesus Christ will do to build His church in practical ways. Support Danelle and I greatly appreciate your support! As we continue to adjust to life back in the US, it greatly humbles us to know you have confidence in us. Your sacrifice for God motivates us to be people of integrity. Your gifts help us pay the bills so we can devote ourselves to serving people. They also build our faith in God and affirm we are doing His will. If you wish to send a special gift, and/or support us monthly, you can visit the GCM website www.gcmweb.org, or call the office, 407-671-9700. Housing Update Waiting! Who likes to wait, and wait, and wait? Not me! Maybe you have been waiting on God for a new job, a spouse, children, or to change the heart of someone close to you. God has been teaching us to wait on Him to provide a house for us close to my mother, to enable us to be settled. It has been challenging to wait for months, and to look at hundreds of potential homes, especially when we already feel a little out of sorts living in the US. “Yet those who wait for the Lord will gain new strength; they will mount up with wings like eagles, they will run and not get tired, they will walk and not become weary.” Isaiah 40:31 God has given us grace to persevere and wait. We finally have a contract on a fixer-upper house just a few minutes from my mother. Praise God! Please pray we will close the middle of October and be in by Thanksgiving. The believers in Atlanta to grow in love for Jesus, one another, and be faithful to share the gospel. The conference in Columbia, SC. Sept 30-Oct 1. God would inspire, lead and meet the needs. Our financial support increase to keep us going strong. Getting settled in our home by Thanksgiving. There is much remodeling work to be done. We would like to return to Ukraine this winter to minister in Kiev and Odessa. Pray for God’s leading. Thank you for your patience and understanding as we transition to living in America. We have been told numerous times how returning is more difficult than moving overseas. We believe it! So much has changed here, as well as in our own lives, that adjusting has not been easy. God has given grace, and your prayers are very valuable to us for these times. We are still in the “unsettled” stage, as they call it. We have been told it can take between 6 months to a few years! We praise God that He never changes - His love, care, and faithfulness are immovable. We have struggled to believe this at times, but here are some people God has used to help us move forward. Missionary Debrief In May we attended DAR, “Debrief and Reentry,” at Mission Training International in Colorado with missionaries from all over the world. It was a wonderful, beneficial time of teaching, reflection, and fellowship with ones who could empathize with us and vice versa. Steve also received good counsel at the Pastor’s conference in June. New Job Description Steve will remain on staff with Great Commission Ministries serving churches in the Southeast and continue his work overseas. He will mentor leaders and begin a network of organic churches in the Atlanta area; assist Riverbend Community Church with their house churches; and help the new house churches in St. Petersburg and Gainesville, Florida. Steve and Danelle will continue their work with Great Commission Europe to assist nationals in discipleship and multiplication of simple churches. They plan to return to Odessa, Ukraine in the next few months. Steve will also continue to write materials for evangelism, discipleship, leadership, and the Faithwalkers devotional. 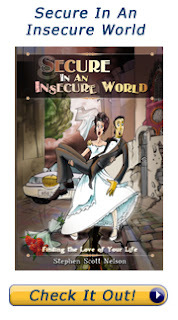 His book, Secure In An Insecure World, is in its third printing and being used around the world. It can be found on Amazon, Barnes and Noble, and I-books now! Support Opportunities You all have been an amazing team of supporters while we worked in Ukraine. Thank you very much! As you can imagine, the cost of living, health care, and travel expenses are higher here than they are in Ukraine. Therefore, Danelle and I will need more financial support ($1,000/month) to serve on staff with Great Commission Ministries here in the United States. Also, GCM allows returning missionaries to receive a one- time housing bonus to help cover their initial housing expenses. Therefore, please prayerfully consider sending a special gift, and/or increasing your monthly support. Some of you may want to start supporting us each month for the first time. You can do so by visiting the GCM website (www.gcmweb.org), or by calling the office, 407-671-9700. We are still full time missionaries for Jesus, and we need you on our team. Please pray for us. Our financial support needs to be met so we can return to serving full time. Finding and getting settled in a home. Starting new simple churches in Atlanta and serving those connected to Riverbend in South Carolina. Wisdom to help churches multiply disciples. The harvest is plentiful here!!! New Year The New Year is a natural time to stop and evaluate one’s life. For those of us who know and love Jesus, it provides an opportunity to examine our lives from an eternal perspective. We are here on earth but a short time. Someone once said, “Life is short, death is sure, sin the cause, Christ the cure.” James described our life as a vapor, “Yet you do not know what your life will be like tomorrow. You are just a vapor that appears for a little while and then vanishes away.” Therefore, we need to make our one life count! Moses said, “So teach us to number our days, that we may present to You a heart of wisdom.” Psalm 90:12 “Is what you are living for worthy of Christ dying for?” someone once asked. It is spiritually healthy to examine what you are doing. Are you accomplishing the goals God has for you? If not, why not? What needs to change and how? Please pray that we too would do some healthy soul searching - to be very fruitful and honor God in all that we do here in Ukraine. Thank you! Columbia, SC Danelle and I always enjoy visiting our friends at Riverbend in Lexington, South Carolina. On Thursday, we attended a house church where my sister and her husband are involved. On Saturday, we participated in their house church leadership meeting. Then, on Sunday, we attended the church service and held a luncheon and a Q and A time with friends and supporters of our ministry. It refreshed our faith to see their desire to reach the lost and make disciples in Columbia and beyond! Andre’s Father Pastor Andre Skyped me in America to tell me the good news about his father’s salvation! I rejoiced as he told me the story. Their church decided to go through Evangelism Explosion to learn how to share Christ. They were encouraged to pray for their lost family and friends and to practice communicating the good news with them. Andre spoke with his father, and he decided to trust Christ as his Savior and Lord. Andre and I made a covenant more than ten years ago to pray for our father’s salvation! Why do people become Christians? The Holy Spirit convicts them of sin and reveals their need for Jesus. God also uses our prayers and our speaking the good news of Christ dying for their sins, and their need to repent and believe. It is so simple eh? How do we miss it? For Ukrainian leaders who would mobilize believers to spread the gospel and make disciples throughout this nation. For Kostia to become a Christian. We had another excellent discussion about salvation recently. He is seeking the truth about God, but only the Holy Spirit can open his eyes. For Scott and Maria’s second son who is due at the beginning of March. For Timmy and I. We will travel to Odessa to teach house churches January 28-31.